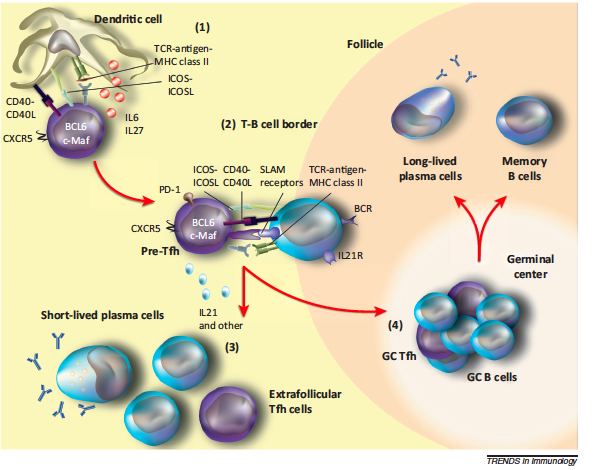 Development of TFH cells and the GC reaction. Development of TFH cells and the GC reaction. (1) Dendritic cells present antigen and activate naïve CD4 T cells via TCR:MHC-II, ICOS-ICOS-L, and CD40:CD40L interactions to initiate the TFH program. DC- and B cell-derived IL-6 and IL-27 cytokines maintain and reinforce this lineage, leading to upregulation of the TFH transcription factors BCL6, c-Maf, and CXCR5. (2) Expression of CXCR5 facilitates the migration of pre-TFH cells toward the T–B cell interphase. Here, cognate pre-TFH and B cells exchange molecular signals including ICOS:ICOS-L, CD40:CD40L, TCR:MHC-II, and several SLAM receptor family members, as well as several cytokines including the cardinal cytokine IL-21, that reinforce expression of Bcl6 and c-Maf that further increase expression of TFH surface receptors. B cells simultaneously undergo diverse signals that instruct their maturation pathway: either extrafollicular or GC. (3) Extrafollicular activated B cells then convert to short-lived plasma cells and secrete antibody with or without extrafollicular TFH cell help. (4) In the GC, prolonged interactions between GC TFH and GC B cells confirm the TFH lineage commitment, resulting in mutual exchange of survival signals that result in GC maintenance. GC TFH cells provide a limiting source of survival signals for which B cells compete based on B cell receptor affinity. Furthermore, GC TFH cells instruct GC B cells to phosphorylate and express activation-induced deaminase that mediates somatic hypermutation, class-switch recombination, and memory cell and long-lived plasma cell formation. BCL6, B-cell lymphoma-6; c-Maf, c-musculoaponeurotic fibrosarcoma oncogene homolog; CXCR5, chemokine CXC receptor 5; GC, germinal center; ICOS, inducible T-cell co-stimulator; ICOS-L, ICOS ligand; IL, interleukin; SLAM, signaling lymphocytic activation molecule; TCR, T cell receptor; TFH cells, T follicular helper cells.